- There are over 2 billion unbanked people in the world in mostly corrupt countries. Easy-to-use cryptocurrencies can change their lives forever. So, in a brief, the real-life value of an easy-to-use cryptocurrency is great. The Electroneum team is led by Richard Ells, who has over 20 years of experience in the digital agency world. In 2013, he founded Retortal’s, a social media management platform that is now valued at around 50 million USD. The rest of the team does not look like an all-star team at all; most of the people do not have university grades at all, but they do something good. Electroneum was one of the largest ICOs, by user numbers, of all time. During the ICO there were 120K contributors who invested a total of 40 million USD and 300.000 people who registered to the Electroneum app. That is impressive and shows us how capable the team is in reaching the mass. That gives us a lot of confidence. Electroneum is competing with other cryptocurrencies for payments. Electroneum is a privacy coin and has a fast blockchain, but does not have very competitive elements in their product. The biggest difference is the market approach of Electroneum. Electroneum managed to raise over 40 million USD from 120.000 contributors in just a few weeks. It was one of the most successful ICO’s ever. 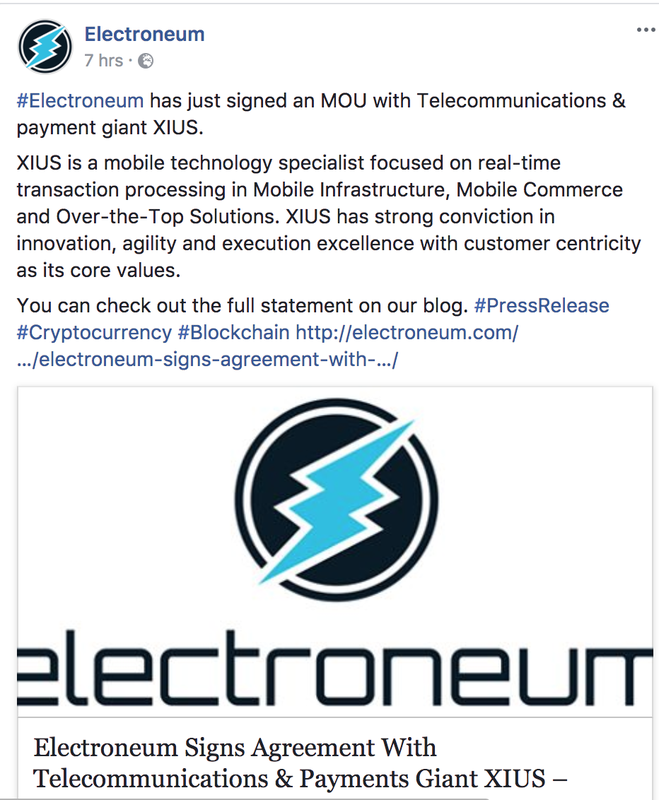 Electroneum created a hype around their product, before there was a product. This resulted in a very loyal community over 300.000 people who are supporting Electroneum. For example, the community created all kind of products to promote ‘’their’’ Electroneum. A loyal community is great, because they are in for the long run. Besides that, the Electroneum team is very transparent to their community, also about major issues. Electroneum had security issues when the ICO ended and therefore it was not possible to launch the app. Electroneum was very clear about the issues and hired Hackerone (one of the best internet security companies in the world) to make Electroneum 100% safe. We think an open communication is great. The ICO price of Electroneum was somewhere around 0.01USD per ETN. At the moment of writing it is around 0.11USD. This is a price rise of 1000% in a few weeks! And, bear in mind, that ETN is only tradeable at one of the worst exchanges Cryptoptia. ETN just announced a major announcement that spiked the price up with more than 40%, this gives us a lot of confidence, even without big exchanges. If Electroneum is keeping up the good work it will be a one dollar coin in a few months! Note: Rumors tell us that ETN will list on big exchanges soon!